Launched three years ago, the Tracer 900 has quickly become established as the definitive Sport Tourer in the growing sub-1000cc class. 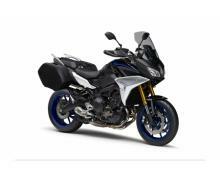 The Tracer 900 GT is a model that comes with a premium specification as standard. Developed from the Tracer 900 and sharing the same 2018 specification upgrades, the Tracer 900GT is designed to offer sport touring riders the ultimate package. 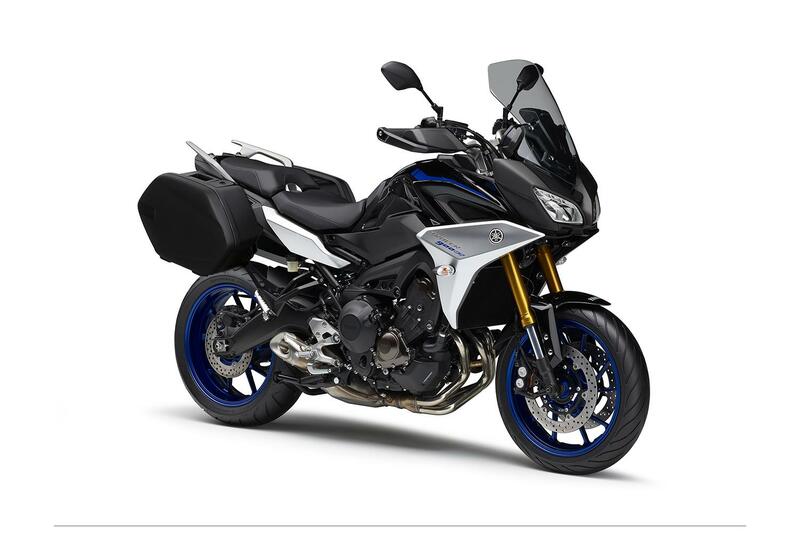 Its class-leading specifications includes a full colour TFT instrument panel, quick shift system for clutchless upshifting, cruise control, genuine matt black hard panniers as standard, fully adjustable suspension and heated grips, the Tracer 900GT is ready to take you anywhere. The eager 3-cylinder engine character combines low-rpm torque with high-revving horsepower. It is smoother than a twin, while the engine is narrow for a comfortable knee grip. The high-specification forks come with a gold finish to underline the premium specification of the GT model, and feature separated damping functions – with compression damping in the right fork leg, and rebound damping in the left fork leg. For easy and convenient rear suspension set up there's a remote preload adjuster for the rear shock. In order to enable the rider to optimise the performance characteristics of the high-torque 3-cylinder engine, the MT-09 Tracer runs with a compact and lightweight aluminium chassis. The space-saving and weight-reducing features employed on the new engine have given our designers great freedom in the design of the frame. The high-specification GT model comes with Quick Shift System (QSS) for seamless upshifting, and for effective operation in different conditions, you can select any one of the three D-MODE running modes. The 3-mode Traction Control System (TCS) gives added confidence on slippery surfaces, while the ABS prevents accidental wheel lock up when braking. For smoother downshifting when entering a bend, the latest model features an Assist and Slipper clutch. By helping to eliminate any sudden shocks to the transmission caused by the downshifting process, the Assist and Slipper clutch helps to maintain chassis stability and poise to give a higher level of controllability. The GT version of Yamaha's leading Sport Tourer gets a range of upgrades that are designed to ensure greater levels of long distance comfort. Narrower handlebars and a larger screen give improved wind protection, while the new seats, improved passenger footrests and grab bar design make long journeys even more enjoyable. The fuel tank has a generous 18 litres capacity, the modern engine has a low fuel consumption good for 300kms between refills. Featuring a narrow centre section and knee indents for added riding comfort, the tank's sculpted design accentuates the modern and edgy image of this stylish and versatile Sport Tourer. The Tracer 900GT is a premium specification Sport Touring model that comes fitted with quickly detachable genuine matt black hard side cases as standard. So whenever you want to get up and go at a moment's notice, the Tracer 900GT is ready. Dave purchased Lithgow Bike Stop in June 1992 and two years later Jamie joined the business and completed his motorcycle mechanical apprenticeship. In 1998 Dave and Jamie formed the partnership that exists to this day. The brothers have always shared a love of motorcycling and have competed at various levels. Lithgow Bike Stop has also supported numerous local riders, assisting with the building and servicing of many winning teams. The respect for both brothers is widely known within the industry and both have assisted Yamaha Australia and Kawasaki Motors with technical advice.